Hinton Mitchem, 74, born and raised at Eastville in Oconee County, Georgia, died yesterday. 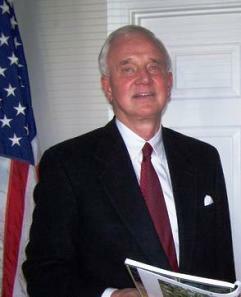 Hinton was a 1956 graduate of Oconee County High School and a 1960 graduate of the University of Georgia. He had a long career in Alabama State Government. Hinton is survived by a sister, Barbara Mitchem Lucas, who resides at the Georgia Club, off University Parkway. Barbara is a 1958 graduate of Oconee County High School and a classmate of mine and my wife. In the late 1950’s, many Oconee Commuter Students to UGA would eat at the Varsity at Lunch and chat. Hinton was one of those students. Former Senator Hinton Mitchem, who served in the Alabama Legislature for more than three decades, died today, January 22, 2013. He was 74. Moss Service Funeral Home in Cullman is handling the arrangements. Senator Mitchem is survived by his wife Judy and his children: Todd Mitchem; Derrick Mitchem and his wife, Heather; Tonya Grindon and her husband, Steve; and Brittnie Mabry; and four grandchildren, Ashleigh, Emma Grace and Henry Grindon and Derrick Hinton Mitchem. He enjoyed spending time with his family, frequent beach vacations with the family and grandchildren, and tailgating at ballgames. This past year was the first Georgia vs. Auburn game he had missed in 48 consecutive games. Traveling and golf were lifelong pastimes. In 1980, Sen. Mitchem sponsored the bill creating the Alabama Housing Finance Authority. By the time of his retirement, the authority had sold $.5 billion in bonds that provided low-interest loans for homes for more than 185,000 Alabama families. Mitchem also took the lead in passing the TVA in-lieu-of-taxes bill that took the money the Tennessee Valley Authority paid to the state and returned it to the counties where the TVA operates. From 1983 to 2010, it meant more than $0 million to schools and local governments in his district. Sen. Mitchem considered it the most important piece of legislation for his district during his service in the Legislature. Former Senator Lowell Barron, who served with Mitchem for almost three decades, said that his work establishing TVA funding was instrumental to all of North Alabama in building new schools, senior centers and other badly needed facilities to serve the public. Mitchem also served on the Joint Legislative Committee on State Parks, serving three times as its chairman. In 1998, Mitchem sponsored and worked hard to get passage of a $10 million bond issue for state parks, including a $6 million renovation at Lake Guntersville State Park in his district. Funeral services for Senator Hinton Mitchem, 74, of Vinemont will be at 2 p.m. Saturday, Jan. 26, 2013, at Moss-Service Funeral Home Chapel, the Rev. Donald Cotton officiating, with interment in Flint Creek Cemetery. Moss-Service Funeral Home is in charge of arrangements. Senator Mitchem was born May 18, 1938, in Georgia to Neal Emory and Gertrude Helen Hinton Mitchem. He passed away Tuesday, Jan. 22, surrounded by his family at his home. He was preceded in death by his parents; and two sisters, Delores (Fred) Sauls and Jo (Jim) Farmer. Survivors include his wife, Judy Corley Mitchem; two daughters, Tonya (Steve) Grindon and Brittnie Mabry; two sons, Todd Mitchem and Derrick (Heather) Mitchem; his stepmother, Lois Mitchem; two sisters, Barbara (Cicero) Lucas and Carol Plastas; and four grandchildren. The family will receive friends from 3 to 8 p.m. Friday at Adams Funeral Home in Albertville. In lieu of flowers, the family requests donations be made to East Flint Baptist Church, 3803 County Road 1354, Vinemont, AL 35179; or to Hospice of Marshall County, 408 Martling Road, Albertville, AL 35951. MONTGOMERY, Ala. (AP) — One of Alabama's longest-serving legislators, former Democratic state Senate President Pro Tem Hinton Mitchem of Union Grove, has died. He was 74. Direct Communications President Rick Heartsill, a friend of Mitchem, said the former senator died Tuesday after a long illness. A longtime tractor dealer in Albertville, Mitchem was first elected to the Albertville City Council in 1968 and then to the state House of Representatives in 1974. After serving four years in the House, he was elected to the Senate in 1978 and in 1982. He gave up his seat in 1986 to run in the Democratic primary for lieutenant governor, finishing third in a field of four. Mitchem was re-elected to the Senate in a special election in 1987 and held the seat until 2010. Alabama Gov. Robert Bentley, a Republican, praised Mitchem. "Hinton Mitchem worked hard on behalf of the people of his district," Bentley said. "I had the pleasure of serving with him in the Legislature, and we had a strong mutual respect for each other. Dianne and I are saddened to learn of his passing. . Our thoughts and prayers are with his wife, Judy, and his entire family during this time." Mitchem represented a diverse district that included small row-crop farmers on Sand Mountain and rich retirees on Lake Guntersville. He never fit neatly into the Democratic Party, and he often said he had the most Republican district in Alabama that was represented by a Democrat. He sometimes fought with the Alabama Education Association and trial lawyers, two usual allies of the Democratic Party, and he drew campaign contributions from Republican-leaning business groups. Mitchem also had some famous battles with Republican governors. In 1996, he used his position as chairman of the Senate Confirmations Committee to block efforts by Republican Gov. Fob James to replace Montgomery banker Bobby Lowder on the Auburn University board of trustees with an executive of Alfa Insurance. In 2007, then Lt. Gov. Jim Folsom Jr. helped Mitchem put together a coalition of Senate Democrats to get elected president pro-tem of the Senate 18-17 over Republican Gov. Bob Riley's choice. Mitchem served a two-year term and turned the post over to another Democrat. After 36 years of service in the Legislature, Mitchem decided to retire and not seek re-election in 2010. His retirement and the defeat of some incumbent Democrats helped Republicans take control of the Senate in the 2010 election and end 136 years of Democratic control. A graduate of the University of Georgia, Mitchem had attended 48 consecutive Georgia vs. Auburn football games until this past season. "Alabama has lost a great leader with the passing of Hinton Mitchem, and I have lost a long-time friend," said former Gov. Jim Folsom Jr., who worked with Mitchem many years in the Senate. "He dedicated his life to making our state a better place, and generations of Alabamians will continue to benefit from his legacy of committed public service and legislative leadership." Moss Service Funeral Home in Cullman is handling arrangements.